With virtual reality and 360 video, the race is on to provide people with immersive access to otherwise-inaccessible locations. For proof, look no further than the BBC’s tour of the Large Hadron Collider and the New York Times placing readers inside the Fight For Fallujah. VR and 360 degree video offers many opportunities to higher education institutions. And they begin before the potential student has even enrolled, with virtual reality recruitment and the online campus tour. VR has the power to persuade, as demonstrated by the Golden State Warriors reported use of VR as part of their recruitment strategy for big-ticket signing Kevin Durant, a move that surely has college athletic departments sitting up to take notice, alongside their academic colleagues. For now, virtual reality campus tours and recruitment experiences may offer a slightly less visceral experience than joining US forces in Fallujah. But with the cost of education rising, and the importance both colleges and students place on campus tours, VR is one way to scale your pitch to students who don’t have the airfare to explore every college on their consideration list. The rise of mobile VR, which requires only a smartphone inserted into a VR headset, makes VR incredibly portable. As YouVisit, a VR company with a vested interest in the subject, points out, bringing VR to a recruitment fair couldn’t be simpler than a few Samsung Gear VR headsets. If you have the content to show, of course. The number of people with access to VR headsets is still relatively low, but high-profile media organizations are not passively waiting for critical mass to happen. 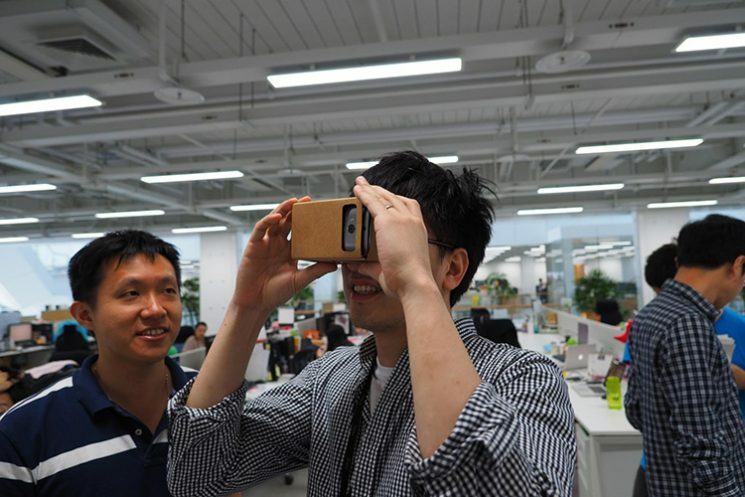 The New York Times has twice shipped inexpensive Google Cardboard headsets to digital subscribers. On the education front, Georgia’s Savannah College of Art and Design reportedly shipped Cardboard headsets to 5,000 prospective students, at a cost of $5 per headset. Media platforms like YouTube and Facebook are pushing the 360 degree video format. YouTube offers a 360 video hub packed with trending 360 videos and playlists of notable examples of the genre. Facebook has a similar page, and of course owns Oculus, one of the leading consumer VR platforms. 360 degree videos are best experienced with a mobile headset, or at least on a mobile device where you can experience a degree of motion control as you move your device to tilt and pan around the environment. But even on desktop, you can scroll around videos like this Virtual Campus Tour for Bloomfield College on YouTube. One challenge for colleges may be the fact that “360 tour” type videos typically move the student from one environment to another in an relatively unimaginative manner. The subtle storytelling offered by video, through direction and editing, are mostly relegated to voice-over and interstitials. Innovative video director Chris Milk is one person looking to evolve the storytelling power of VR, by activating empathy in viewers. We may still be at a point with VR and 360 video where it’s easier to show you what a college looks like than what it feels like to be a student there. But that’s surely coming. And potentially revolutionizing the college campus tour in the process. Interested in innovation in higher education marketing? Give Kiosk a call.